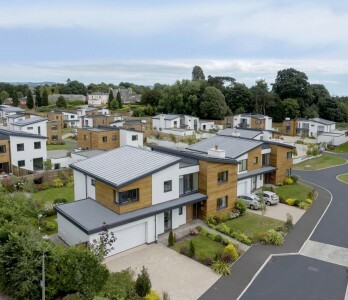 Holland Park is Exeter’s first ever zero carbon housing development. Located at the edge of Exeter Golf and Country Club in Old Rydon Lane, it comprises 40 premium properties made with exceptional craftsmanship and fitted with furnishings and appliances of the highest specification. Each property is AA energy rated under the UK’s Standard Assessment Procedure (SAP) regulations and all have zero carbon emissions due to their use of solar PV systems. The construction specification for the luxury properties in Holland Park highlighted the need for energy-efficient products that also offer a striking contemporary style. To achieve these characteristics, the project’s installer Progressive Systems Ltd chose Euroclad’s VieoZinc warm roofing system to be used on the properties.